Dave Barber pours at the BevX Welcome Reception. The Atlantic Seaboard Wine Association was proud to participate in the third annual BevX Wine and Beverage Expo on February 21-22, 2018. With attendees from all over the country gathering in our nation’s capital, the cooperative atmosphere of the conference captured the excitement of this dynamic industry in which so many of us work. 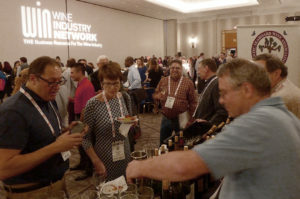 Winemakers and grape growers, marketers and distributors, writers and winery vendors, and wine associations such as the ASWA — all could be found in one spot this past week. BevX provides a great opportunity for trade people from all over to sample Atlantic Seaboard wines. 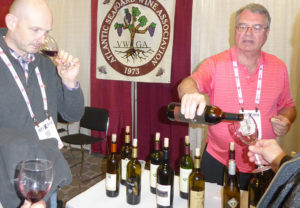 One element that distinguishes the Atlantic Seaboard Wine Association from others is its regional purview which spans the entire eastern seaboard of the U.S.
ASWA’s signature Competition draws from this area and brings together respected judges from all corners of the country to evaluate and determine the best wines released in a given year. The competition generates a host of opportunities for our wines to be exposed to wine professionals of all different stripes, including those who gathered for BevX. The BevX luncheon for attendees was an additional venue in which to showcase Atlantic Seaboard wines. BevX was a tremendous opportunity for the Atlantic Seaboard Wine Association to showcase wines on opening day because quite often these wines are not widely tasted outside their state of origin. as far afield as California, New Mexico and Colorado. 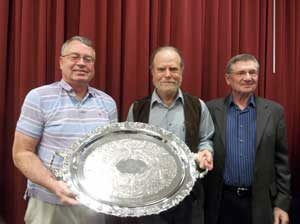 Paul Vigna (center) receives the Birchenall award from Grant Crandall (right). With so many emerging growing areas all over the country, the ASWA was able to provide a unique glimpse into the relatively recent explosion of quality wine vinified up and down the East Coast. The Atlantic Seaboard Wine Association values it relationship with BevX and looks forward to partnering again in future years. Dave Barber, Jim Law of Linden Vineyards, and Grant Crandall. The ASWA participated extensively in the BevX Conference and Trade show in Washington, DC held at the Washington Marriott Wardman Park Hotel. The conference included an extensive group on seminars on winemaking, viticulture and winery business matters along with a large trade show. 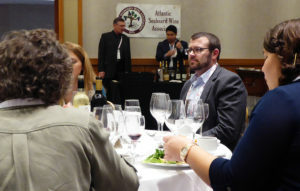 It also included a conference for wine associations from across the nation. The ASWA poured some of the top wines from our Competition throughout the conference and provided all of the wines for the keynote luncheon of the associations meeting. 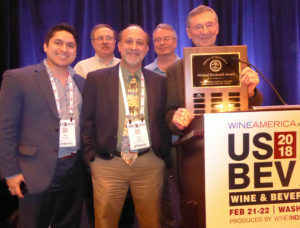 At the conference Jim Law of Linden Vineyards was presented with the Productivity Tray Award by the ASWA.